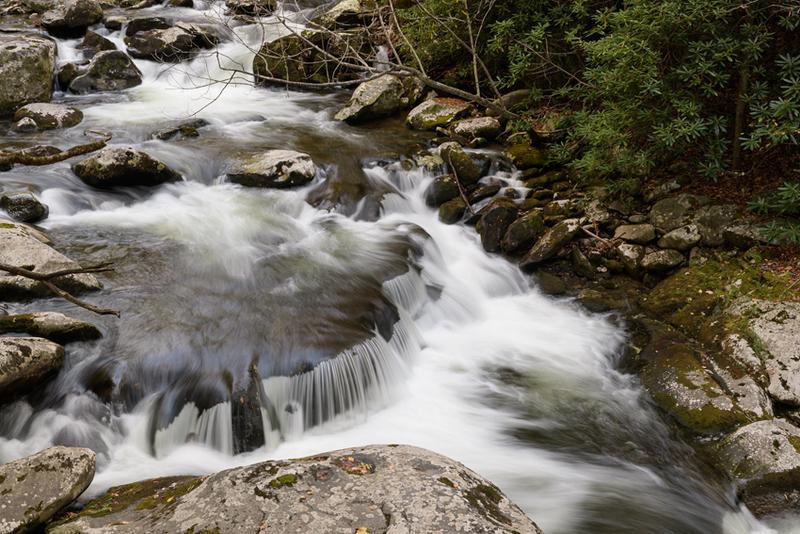 While scouting in preparation for our Great Smoky Mountains Institute at Tremont (GSMIT http://gsmit.org/photography-workshops/} fall photography workshop, I visited one of my favorite cascades to make sure it would be a good place to bring the participants. This first photograph was made on Thursday, October 19, 2017—the day before the workshop was to begin. Water levels were so low, that even the full bottle of water I had with me wouldn’t help the situation! No rain was forecast until the last day of the workshop. Obviously, we’d have to find other subjects to shoot. It poured rain overnight Sunday, October 22, and continued through when the workshop ended mid-day Monday. 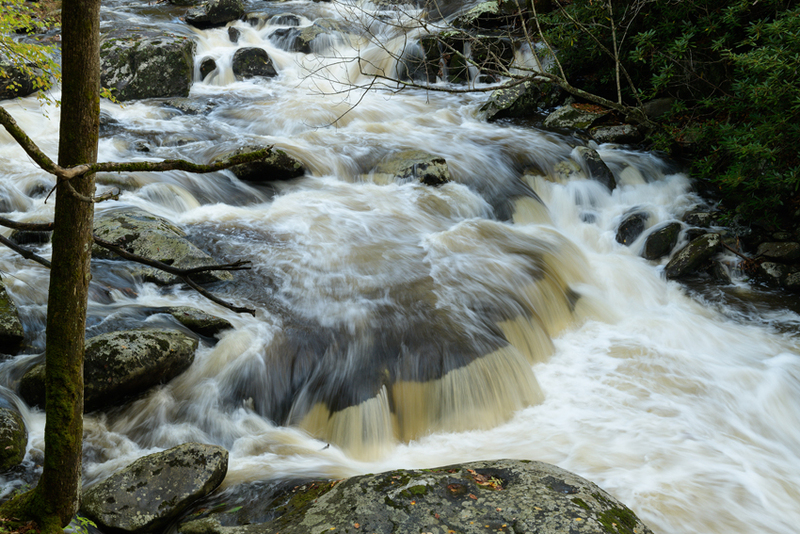 Monday afternoon, I returned to the cascade. This time, it was almost overflowing with silt-filled water. Still not photogenic. 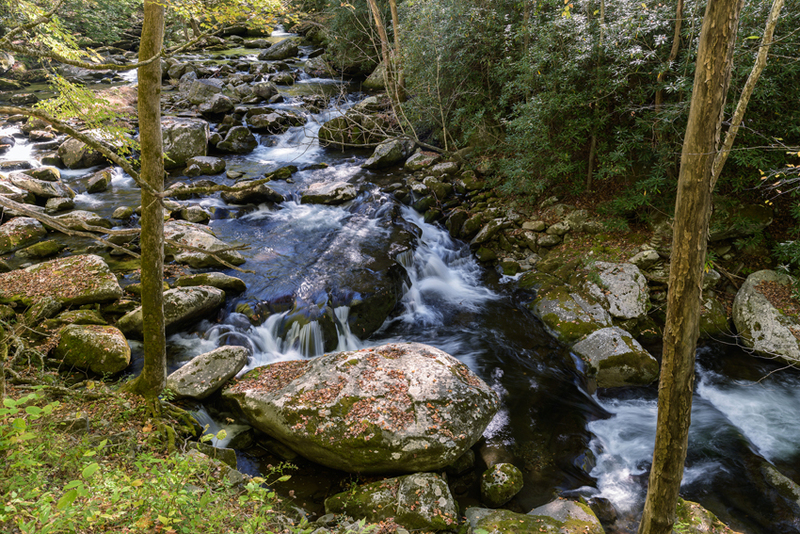 Water levels change rapidly in the Smokies, and by the next day, the water was clear and at nearly perfect levels and flow rates. These were good reminders that landscape and nature photographers are completely reliant on Mother Nature for the conditions we face. We must incorporate whatever water levels, fall color changes, light, clouds, fog, wind, rain, snow, dust, drought, fire, etc., we encounter. That’s why it’s so difficult to duplicate an image we’ve either made or seen before. It’s also why we need to remain flexible when we go out to shoot.